The Transfiguration Mount and what happened there is hugely important! Be sure to read the previous two installments of this excellent study of the Transfiguration of Christ, by Daniel Rogers. Here is #1 and #2. The following material will compliment the one in article #2, and it will shed more light on it. In the transfiguration account, Elijah and Moses disappear after God pronounces, “This is my beloved son… listen to Him.” There are several passages, as has been shown, that teach that the Law and the Prophets had not yet pass away at the time of Acts 2 and would not pass away until AD70, but there are others that are just as explicit as the passages already mentioned. Hebrews 8:13, for instance, says, “When He said, “A new covenant,” He has made the first obsolete. But whatever is becoming obsolete and growing old is ready to disappear” (Hebrews 8:13). The Old Covenant, according to this passage, was ready to disappear – which means that it had yet to vanish away at the writing of this book. On the taking away of the Old Covenant, the Hebrews writer goes on to say, “Then He said, “BEHOLD, I HAVE COME TO DO YOUR WILL.” He takes away the first in order to establish the second” (Hebrews 10:9). This passages shows that there was a transition between the two covenants. As the New Covenant is revealed more and more through the work of the Holy Spirit, the Old Covenant gets closer and closer to vanishing away. At the writing of Hebrews, it was ready to vanish away. In fact, the Hebrews writer says, “FOR YET IN A VERY LITTLE WHILE, HE WHO IS COMING WILL COME, AND WILL NOT DELAY” (Hebrews 10:37). The coming of the Lord was in the near, near future! In Paul’s letters he referred to life under the New Covenant has the New Creation: “Therefore if anyone is in Christ, he is a new creature; the old things passed away; behold, new things have come” (2 Corinthians 5:17). Notice the similarities between 2 Corinthians 5:17 and Revelation 21:1-5: they both describe a new creation, old things passing away, and all things becoming new. These new and old things are not related to the physical universe, but to the changing of the covenants at the fall of Jerusalem in AD70. The Old Covenant was temporary, but the words of Jesus will stand forever. The transfiguration paints a picture of the coming of the Lord. It is a spiritual event that marks the end of the Old Covenant age – not “when time shall be no more.” John as Elijah served as proof that the day of the Lord was at hand. In fact, the axe had already been laid to root of the tree. The tree was tumbling, and in Hebrews it was ready to vanish away. It is a shame that many read over the Transfiguration event without keeping in mind Peter’s advice to take the transfiguration as a picture of the coming of the Lord. Be sure to get a copy of the book, Like Father Like Son, On Clouds of Glory, for even more, in-depth discussion of the importance of the Transfiguration for understanding Biblical eschatology. 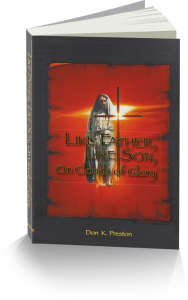 This book contains a fantastic study of the Transfiguration! Next Next post: Can God Tell Time?